Need some help here. On another forum, no not that forum, I was talking to a fella about weights of swords. and that was way to heavy for a "single hander" Can anyone give me references for weights of baskethilted swords. I think they were generally a bit heavier than that, actually. Paul Wanger says 2.6 to 2.9 pounds in his book on George Silver. Many replicas with compex hilts get up to 3 pounds, such the A&A Town Guard Sword and some of the Armour Class baskethilts. that sounds pretty much right on, I'm sure (maybe Mac can help out), that some are in the range I posted above. I'm just alitttle miffed at being told that b-h broadswords ie, single handed (by the other poster and another site) are much lighter. I posted twice, stating b-h boardsword/backsword and it just didn't seem to sink in. He seems to be an "expert" after many years of using all types of swords. I just don't buy what he's saying. ...Can anyone give me references for weights of baskethilted swords. 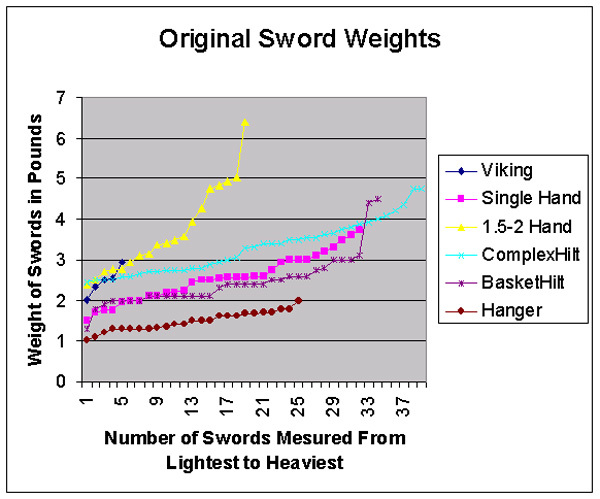 A while back I plotted the sword weights I could find in publications. I have plotted the data from lightest to heaviest to show the range (this throws some people off because they want to see groupings) However in this configuration you can more easily see the maximum and minimum weight and where the line levels out in the middle represents the median weight for that group. It looks as though the median for baskethilts is around 2.5 pounds. Yeah, that's strange. Even without a baskethilt many single handed swords were 2.5 pounds or more. If someone asked me what the standard weight of a singe handed sword was, I'd probably answer that it was about 2.5 pounds. EDIT: Whoa, interesting graph. I'd love to see the 1.2 pound or the 4.5 pound baskethilt - though I sure wouldn't want either one in a fight. 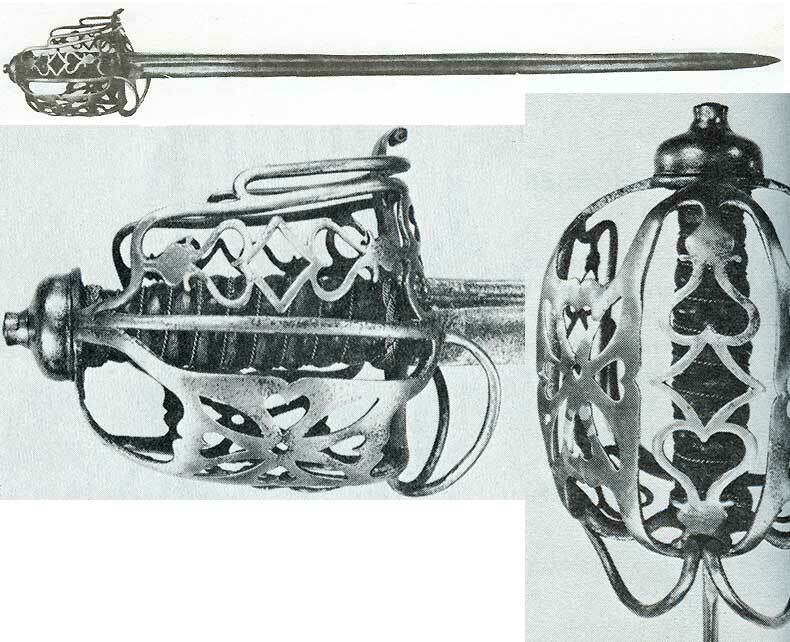 From George C. Neumann's "Swords and Blades of the American Revolution"
I handled a sword identical to the second "English Horseman's Saber" -- Actually a Backsword, by Samuel Harvey. It was intended for service, for actual battlefield use. And yet it felt like a boat anchor. One of the worst handling antique swords I've ever handled. Heavy and dead in the hand. 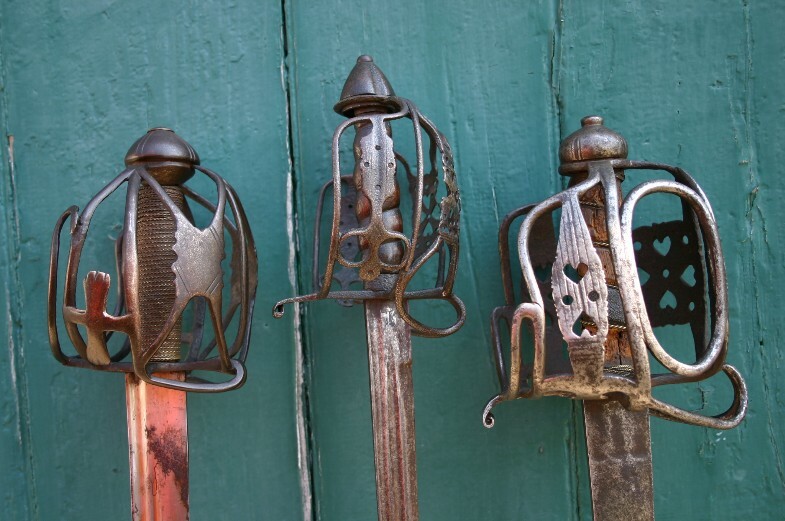 But I'd say most antique basket hilt swords I've handled have averaged around 2.5 lbs -- some heavier, some lighter. 2.5lbs average basket weight is probably close... I think Vince Evans came up with a similar figure at one time on an old SFI thread. Antique baskets I've handled have ranged from one that's just under 2 lbs (1.8 or 1.9 lbs) to one that's right about 3 lbs. 34 examples (in Neumann's book) have a combined weight of 76.7 lbs. which would average out at 2.2558 lbs. apiece ! thanks so much for all the help. I knew that I wasn't a dummy and I'd done my homework! I just wanted to double check before continuing my conversation with this fella. Hey Mac, whats the name of Neumann's book. 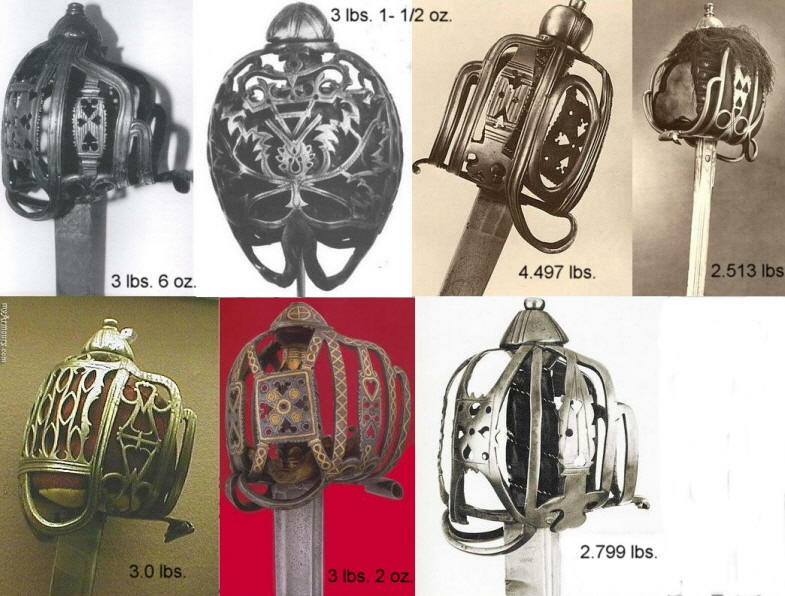 Kirk mentioned it above: George C. Neumann's "Swords and Blades of the American Revolution"
I've never weighed the individual components on these pieces but my guess would be that the weight is fairly distributed between blade & hilt, albeit in large, medium, & small ! The horseman basket is a good sized piece of steel, but so is the blade that's mounted to it (ie: thick ). 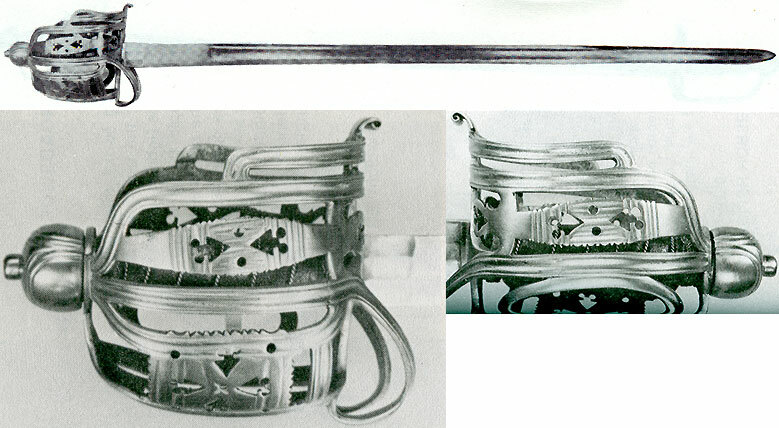 The 19th century basket is very light, with its elements being very thin, but , again, so is the blade ! ask, are those yours now? Aye, they be caretaker Mac's ! I picked up the Irish hilted backsword via Rob at Lion Gate Arms & Armour,Inc.. 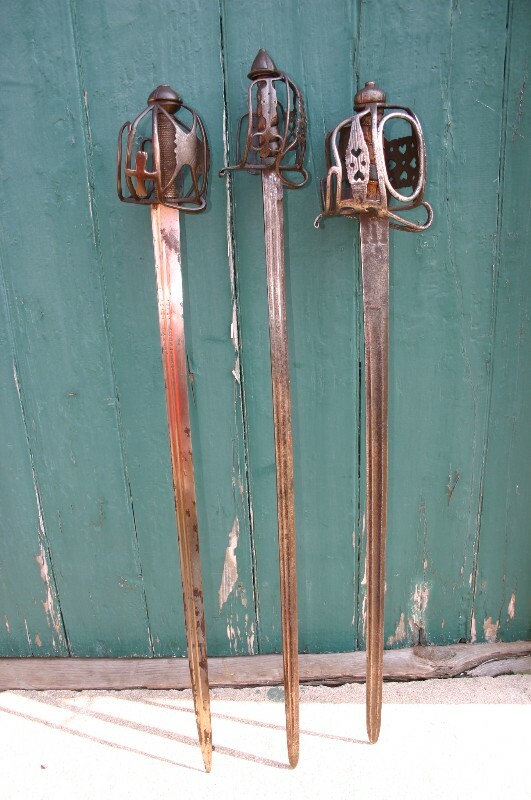 The 19th century 'Regimental' broadsword via Freeman Auction House, during one of their "live auctions" on Ebay ! The English horseman backsword was an Ebay grab ! Awhile back, Vince had sent me some weight figures on a few original Scottish baskethilts that a friend had let him study !